On July 20, 1969, US astronaut Neil Armstrong became the first man to walk on the moon. This is the story of the Apollo 11 mission and the 'space hardware' that made it all possible. From the evolution and design of the Saturn V rocket, the Command, Service Modules, and the Lunar Module are described. Launch procedures are described, 'flying' the Saturn V, navigation, course correction 'burns', orbital rendezvous techniques, flying the LEM, moon landing, moon walk, take-off from the moon, and earth re-entry procedure. Includes performance data, fuels, biographies of Armstrong, Aldrin and Collins, Gene Kranz and Werner von Braun. 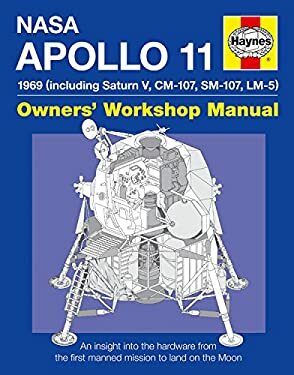 Detailed appendices cover all of the Apollo missions, with full details of crews, spacecraft names and logos, mission priorities, moon landing sites, and the Lunar Rover.